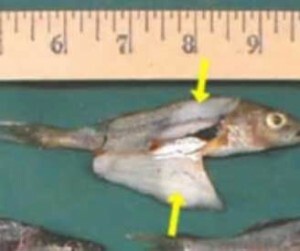 Heterosporosis is a parasite that infects and degrades muscle tissue of yellow perch and other fish species. The parasite creates thick sporophorocysts, in which spores develop. Between 8 and 16 spores grow inside vesicles found inside the sporophorocysts. Fish infected by the parasite experience muscle tissue break down making them more susceptible to predators. 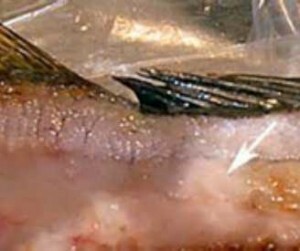 Infected fish have white and opaque flesh. This is particularly bad because spores from heterosporosis get released and are ingested by fish through the water column or eating on other infected fish. The spores can remain infective in water for up to two months at 21°C and up to a year at 4°C. This allows it to affect a number of fish species such as walleye, northern pike, rainbow trout, channel catfish and yellow perch. Yellow perch seem to be affected most by this parasite. When the spores get into the system, it begins to break down the muscle tissue of the fish, making them much more susceptible to predators. Not in Nebraska. It is currently occurs in the Great Lakes region including Michigan, Minnesota, Wisconsin, and Ontario. Believed to be native to Europe and Asia. It is unknown how it was introduced to the United States. It is spread by transportation in water in live wells, bait buckets, and the bilges of boats. Spores from heterosporosis are released in the water column and are ingested by fish or they are spread through fish eating infected fish. The spores can remain infective in water for up to two months at 21°C and up to a year at 4°C. This allows it to affect a number of game and native fish species including walleye, northern pike, rainbow trout, channel catfish and yellow perch. Yellow perch seem to be particularly susceptible to this parasite. Fish infected by the parasite experience muscle tissue break down making them more susceptible to predators. Learn more here.